After the unveiling of Bose QC 35 II high-end headphones with Google Assistant, Bose proved to have another ace up their sleeve. This time, it is something slightly different. Aside from SoundWear companion speaker that wraps around your neck, there is a new SoundSport Free In-ear Headphone. Did Apple AirPods get a well-worth rival? Continue reading through this compelling article to learn more about the latest Bose SoundSport Free In-ear headphones and whether they live up to the challenge. SoundSport is completely wireless pair of headphones, dedicated to athletes and everyone who wants to maximize their mobility whether it is about completing a workout, studying, or doing anything in particular. For its primary purpose, sport, Bose has ensured that they were water and sweat resistance (With Ipx4 rating), allowing the users to soak, as long they won’t use the headphones while swimming. Another beneficial feature of these wonderfully engineered earbuds is that they are weighing light as near as feather, ensuring further portability. Each earbud weighs 0.35 ounces while measuring only 1.1-inches high. Anyone who has been using wireless headphones knows that the Bluetooth reliability is not always in its place. Whether it is wall, wind or other obstacles, it is nearly impossible that the headphones will be connected to the phone always. With that in mind, Bose features an innovative antennae system for a cover-range of 30 feet away. The battery life at 5 hours lifespan might sound modest to some. Still, it is fundamental to note that the earbuds come equipped with a charging case, which fixes the buds in one position. The case offers two full charges extending the battery life for 5 more hours. Just like with QC 35 II, Bose SoundSport Free offers a free app which helps you maintain your soundtracks, playlists, and much, much more. Being so portable, SoundSport Free wouldn’t be surprising if you put your headphones in place not easy to be seen. Bose covers up this inconvenience too. Inside the app, there is a hidden feature called “find my buds.” It enables the user to track the earbuds in the last place they were used, as well as providing the last time of use. Furthermore, there is an option to access Google’s, Samsung’s or iPhone’s digital assistant by clicking the button located on the right earbud. Bose SoundSports is the first truly wireless pair of headphones by Bose. That means that wires are a thing of past, even that one wire for snuggling around your neck is gone. Fortunately, Bose didn’t ditch absolutely every trademark of the famous Bose SoundSport series. The StayHear+ tips (in sizes S/M/L) still make their appearance on the earbuds making it safe for your ears and eliminating the possibility to lose your earbuds even during the most intense workouts. Unlike Bose QC 35 II that started shipping on Thursday, SoundSport Free will be officially released at the beginning of October, when they will start with the shipping as well. Unfortunately, those who love colorful workouts will have to take a rest with the black model or wait until midnight blue, and yellow citron sees the light of the day. 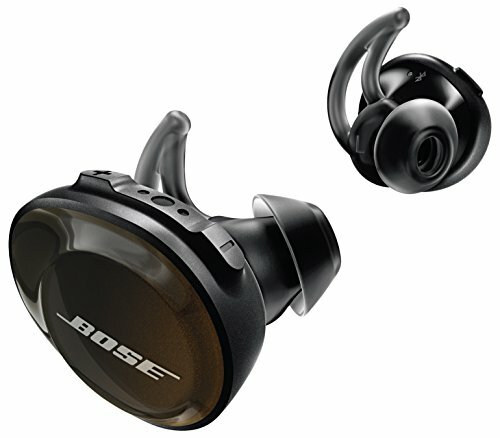 We are crossing fingers and eagerly waiting for the earbuds of the year- Bose SoundSport free, until we get a chance to review them. Do you think that other great headphone brands plan to move earbud compatibility to this level? Let us know in the comments! Get A Headphone is a participant in the Amazon Services LLC Associates Program, an affiliate advertising program designed to provide a means for sites to earn advertising fees by advertising and linking to (amazon.com, amazon.co.uk or endless.com, MYHABIT.com, SmallParts.com, or AmazonWireless.com).